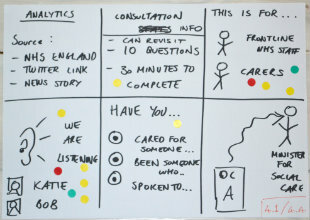 We blogged back in December about the user research we were doing as part of a Discovery phase around how the department runs digital consultations. Since then we've wrapped up the project and are cracking on with the next steps, but first here’s the how, what and why of what's been done so far. 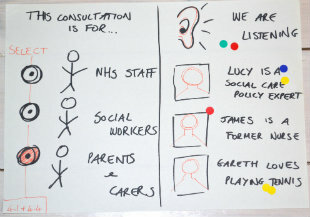 Consultation response curators, who collate responses on behalf of an organisation such as a charity or a trade union. Policy makers in the Department. As Liam explains in our webinar below, user personas are by no means foolproof but they’re a really useful way to contextualise our users and to think through the challenges that person would typically face beyond the actual task itself. For example, our potential respondent Keith is extremely time-poor due to his caring responsibilities for his son David, so we need to ensure we focus on making the most of Keith’s precious time and avoid making the consultation process more lengthy or complicated than it needs to be. Building on the personas we generated an extensive (but by no means exhaustive) list of user needs, and employed the well-worn technique of card sorting to prioritise these into groups. Each of us took one user need at a time and sketched out some ideas as to how we might go about meeting that need. The group then voted on each other’s ideas and those with the highest ratings got taken back and refined further, until we had a library of prototypes to take forward. A final thought: as a Product Manager, I was surprised when we realised the solution was not build a new product or service. Instead we could better meet the user need simply by using our existing tools more effectively, and by writing in clear English with regular communications throughout the policy making process. It'll require a fair bit of effort but thankfully no hard cash. Which is always nice. Yet another example of somebody doing things right in isolation, some of us (won't mention which part of Gov) are still suffering with our management insisting we out-source when we can and have done a better job for less than a tenth (time and money) of what everyone else quoted. Hi Andy, Thanks for your comments. DH is always happy to share learnings and this blog is one of several ways in which we’re doing that. More posts on this topic coming soon. Maybe it would be a good idea to speak with the consultation institute. The design should also ensure that consultations adhere to the law and avert judicial review. Thanks for the tip - we did pick up on the role of the Consultation Institute as part of this project and will certainly keep them in mind as we progress.